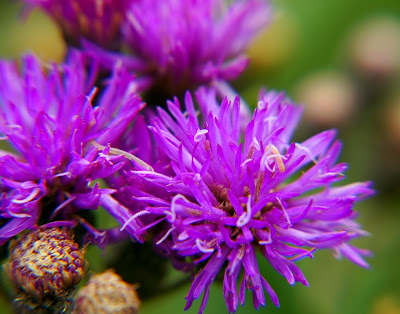 Misty's Musings: Vernonia Baldwinii... Ya Know Her? Well, I love flowers, especially wildflowers... and I love purple (really love purple)... so it's no wonder I LOVE these purple wildflowers. 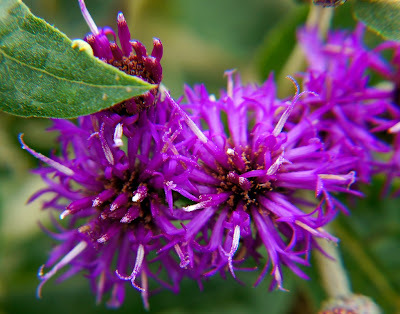 :-) Ironweed is the common name for Vernonia Baldwinii. Kinda sounds like a lady's name, huh? 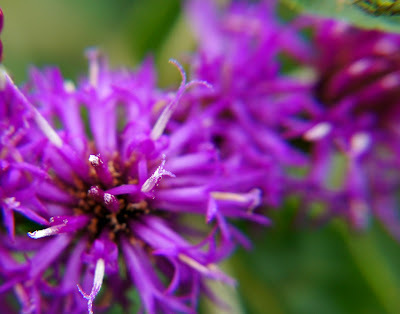 Ms. Baldwinii, but you may call me Vernonia. hehe... sorry, I'll stop now. Hey, lighten up... we're looking at flowers. Besides... we're looking at PURPLE flowers! It just doesn't get any better. I don't know Miss Baldwinii, but I think I'd like to. She's lovely. PS, re your question, his is a DSC H50 with 15X zoom. I have only heard this flower called Ironweed but I like Vernonia much better. Beautiful shots. You've captured their detail and just how different the color is up close from the fields of purple. Another nice wildflower from Missouri...and a purple one to boot. Now I know their REAL name--thanks, my purple friend. These photos of your Miss Vernonia Baldwinii definitely make me smile, and so does your commentary. Thanks Misty and have a great week. Very Cute! I love purple flowers as well. I just redecorated my room and have a new bedspread with purple flowers all over it i can't recall the name of the flower but they are puff like flowers. i was also able to find a nice lamp with light purple shade with a darker purple stitching. I simply love it.